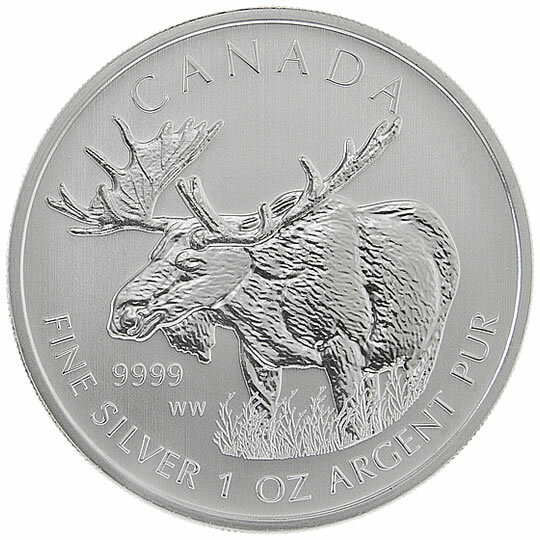 Canadian Wildlife Silver Bullion Coins are produced as a three-year series issued by the Royal Canadian Mint. Dates on each are either 2011, 2012 or 2013. A total of six unique coins are included within the series, each featuring a unique reverse design showcasing a different member of the diverse creatures found in Canada. Every coin is struck from one ounce of .9999 fine silver to a diameter of 38 mm. The 3.29 mm thick strikes have a reeded edge and a legal tender face value of CAD $5. Despite the investment-intended nature of the bullion coins, many collectors have also shown extreme interest in the series. That is largely attributable to the unique designs, level of silver purity and the limited mintage nature of the program. 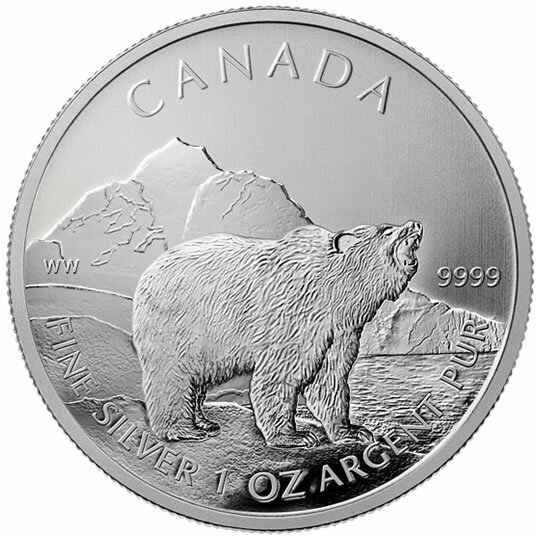 Coins of the Canadian Wildlife series feature a maximum mintage of 1,000,000 per design. All six silver bullion coins contain the same basic obverse portrait of Queen Elizabeth II. Designed by Canadian artist Susanna Blunt, the portrait is surrounded by the inscriptions of ELIZABETH II, 5 DOLLARS and the relevant year 2011, 2012 or 2013. The reverse of each coin depicts a different creature of Canadian wildlife. Reverse inscriptions include CANADA, 9999, FINE SILVER 1 OZ ARGENT PUR and the initials of the artist for the design. 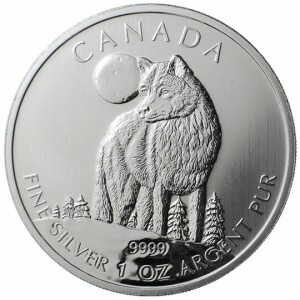 2011 Canadian Wolf Silver Bullion Coins made their debut in September of 2010. As indicated by the name, the coin depicts a wolf on its reverse. The snowy scene of the canid also includes an image of a full moon. The reverse was designed by Senior Royal Canadian Mint Engraver William Woodruff. The Royal Canadian Mint released 2011 Grizzly Silver Bullion Coins in January of 2011. A roaring mature grizzly bear is shown on the reverse of the strike along the edge of a body of water. Like the first coin of the series, the reverse of this coin was also designed by Senior Mint Engraver William Woodruff whose initials can be seen to the left of the bear. 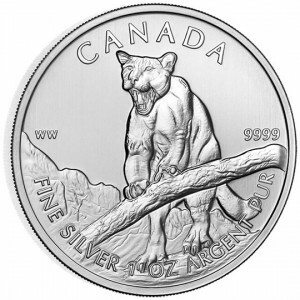 Issued in September of 2011, the 2012 Canadian Cougar Silver Bullion Coin appeared as the third strike of what had become an extremely popular series. 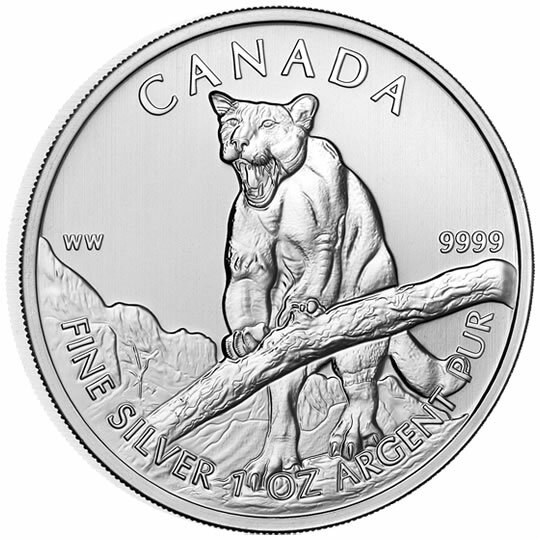 Showcased on the reverse is the image of a cougar which is also known as pumas, mountain lions or mountain cats. The William Woodruff design shows the cat with its front paws on a fallen tree limb. 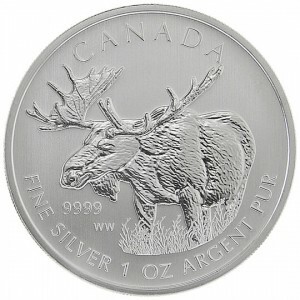 2012 Canadian Moose Silver Bullion Coins made their initial appearance in February of 2012. Also designed by Woodruff, the reverse of this coin shows a moose, complete with large palmate antlers, standing among the tall grasses of its native region. 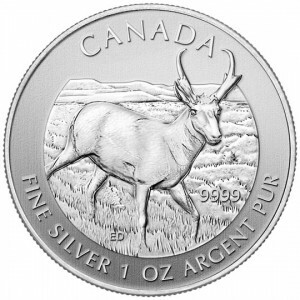 The Royal Canadian Mint first announced details of 2013 Canadian Pronghorn Antelope Silver Bullion Coins at the American Numismatic Association’s World’s Fair of Money in Philadelphia, Pennsylvania in August of 2012. The strike showcases a pronghorn antelope on the reverse with a design by Canadian artist and coin designer Emily S. Damstra. By using BullionVault you can buy physical gold & silver by the gram at current market exchange rates. Create a free account now and get 4 g's of free silver as a welcome bonus.